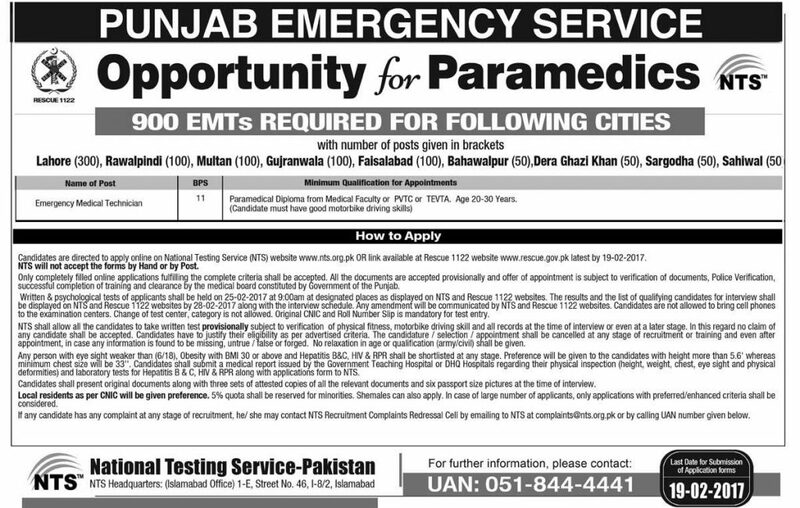 The latest 900 medical jobs are announced for paramedical staff in Punjab by Rescue 1122 for Motor bike Ambulance service that is being announced in the all divisions of Punjab. Find the complete detail of New 900 EMT Medical Jobs Rescue 1122, 04 February 2017 here. 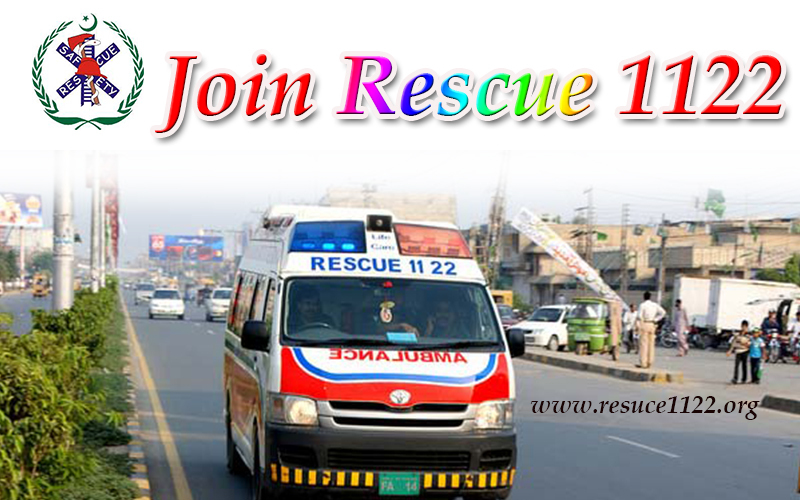 Candidates are directed to apply online on National Testing Service (NTS) website www.nts.org.pk OR link available at Rescue 1122 website www.rescue.gov.pk latest by 19-02-2017. Only completely filled online applications fulfilling the complete criteria shall be accepted. All the documents are accepted provisionally and offer of appointment is subject to verification of documents, Police Verification, successful completion of training and clearance by the medical board constituted by Government of the Punjab. Written & psychological tests of applicants shall be held on 25-02-2017 at 9:00am at designated places as displayed on NTS and Rescue 1122 websites. The results and the list of qualifying candidates for interview shall be displayed on NTS and Rescue 1122 websites by 28-02-2017 along with the interview schedule. Any amendment will be communicated by NTS and Rescue 1122 websites. Candidates are not allowed to bring cell phones to the examination centers. Change of test center, category is not allowed. Original CNIC and Roll Number Slip is mandatory for test entry. appointment, in case any information is found to be missing, untrue / false or forged. No relaxation in age or qualification (army/civil) shall be given. Any person with eye sight weaker than (6/18), Obesity with BMI 30 or above and Hepatitis B&C, HIV & RPR shall be shortlisted at any stage. Preference will be given to the candidates with height more than 5.6′ whereas minimum chest size will be 33″. Candidates shall submit a medical report issued by the Government Teaching Hospital or DHQ Hospitals regarding their physical inspection (height, weight, chest, eye sight and physical deformities) and laboratory tests for Hepatitis B&C, HIV & RPR along with applications form to NTS. Local residents as per CNIC will be given preference. 5% quota shall be reserved for minorities. Shemales can also apply. In case of large number of applicants, only applications with preferred/enhanced criteria shall be considered.